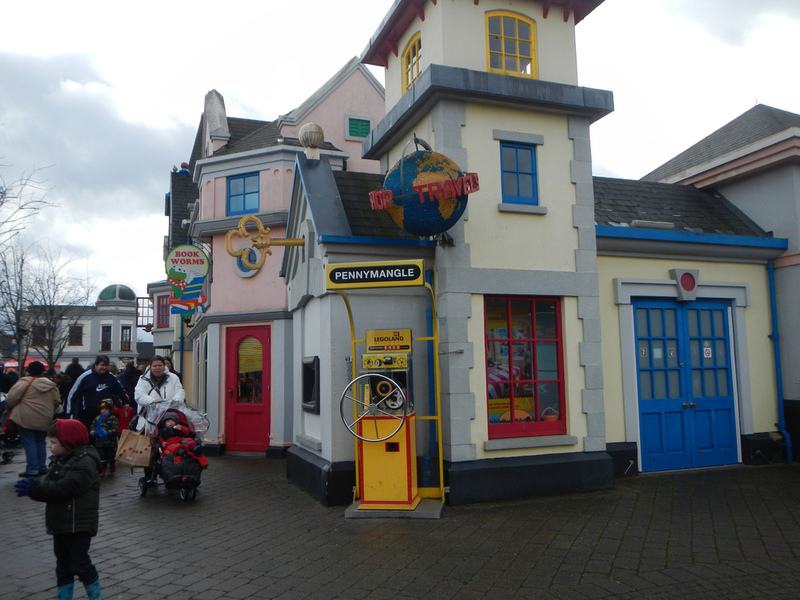 England March 2013- LEGOLAND Windsor Part Two — Always Packed for Adventure! If there is one thing that every theme park needs, it's a corny pirate show. 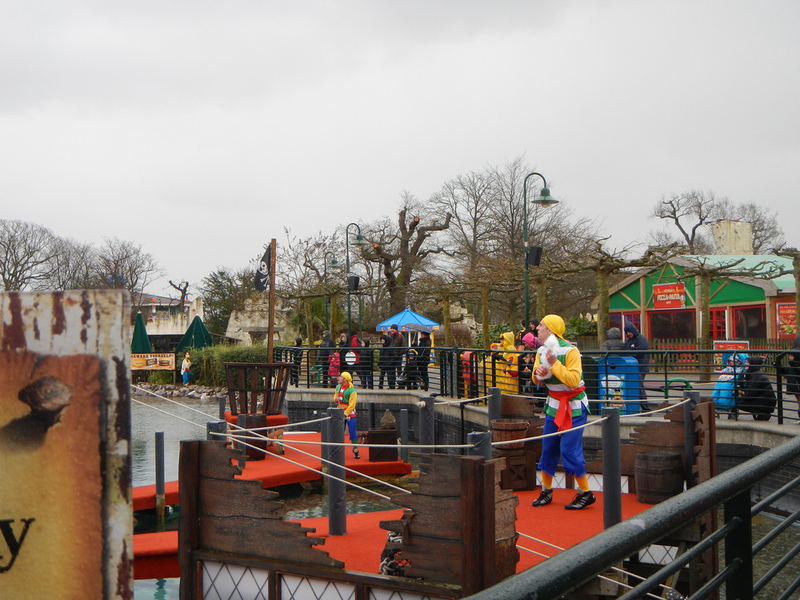 Legoland Windsor just might have the corniest pirate show of them all. However corny, it managed to keep our attention as we stood out in the rain to catch the first show of the season. 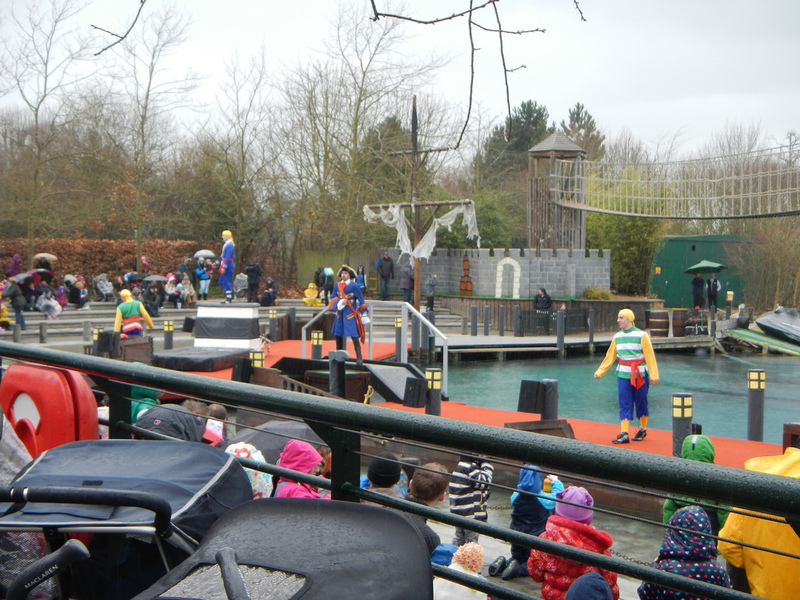 The first Pirate show of Legoland Windsor's 2013 season! The good pirates danced, sang, did some flips and stunts...all while trying to evade the bad band of pirates. I felt sorry for them having to do the show in the rain, but I'm guessing that living in England, they're used to it. The whole show is performed around a pool of water, so there are many water effects and even a boat chase. I'm sure that in the summer, they take every opportunity to shower the audience. Mother nature was already taking care of that part. If you must watching the Pirate of Skeleton Bay in the rain, the best tip I have to impart is to grab a warm cup of coffee first. 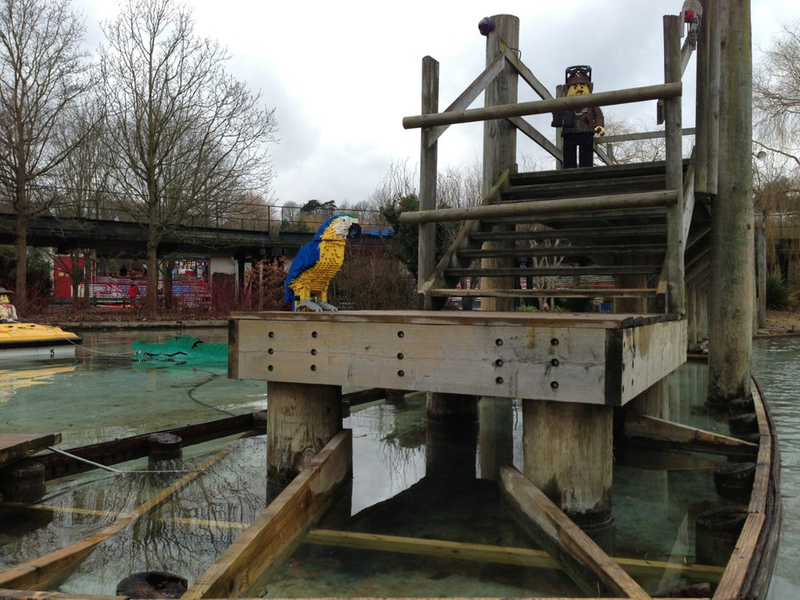 Actually, if you visit Legoland Windsor on a cold or rainy day, a warm drink will be your best friend. It kept us sane. Prior to the pirate show, we stopped at a nearby restaurant for mini donuts and lattes. It was a nice treat, too bad the restaurant was infested with spiders! 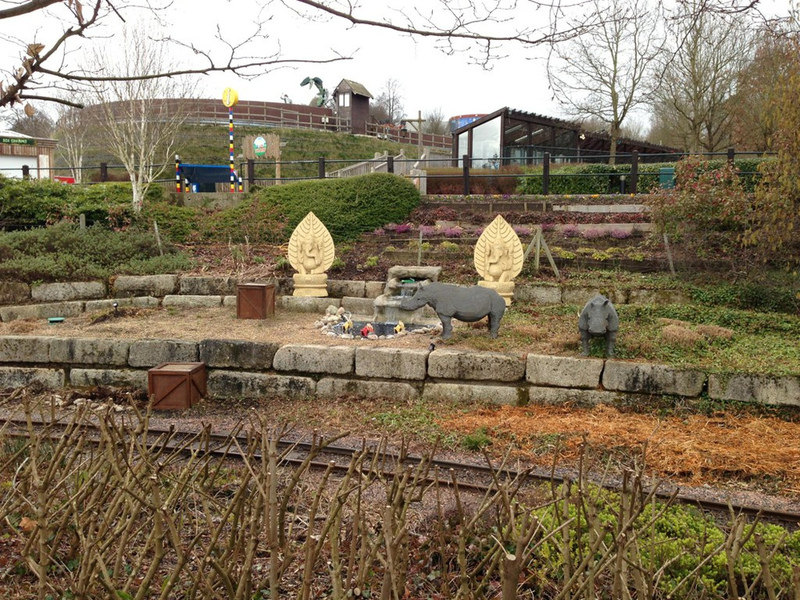 Legoland Windsor had so many creative touches. Here are some of the buildings close to the Pirate show and donut restaurant. I love the Lego bookstore! One of first attractions of the day was the Laser Raiders, located in the Kingdom of the Pharaohs section if the park. Laser Raiders is an interactive dark ride, where each rider is given a laser gun to aim at targets for points. It has a massive queue layout (of course I took pictures) and it made us realize our good fortune to be visiting on a slow day. 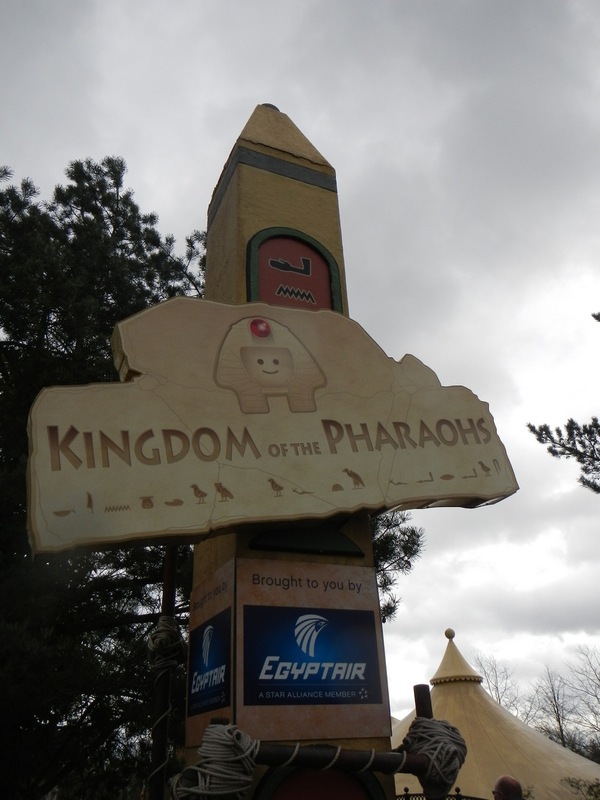 The Kingdom of the Pharaohs also includes a ride called Bouncing Scarabs, which is a very mild dropping platform ride. Dan's five year old daughter loved it and probably would have been happy to go on the Bouncing Scarabs all day long. Also in the Egypt themed section was the Aero Nomad, a balloon flight themed ferris wheel. One of my favorite former attractions at Disneyland was the Fantasyland Motor Boats. As a kid, the boats were definitely on my top-ten favorite attractions list. Legoland Windsor has their own version of the Motor Boat Cruise, but it's even a bit of a Motor boats-meets-Jungle Cruise hybrid. 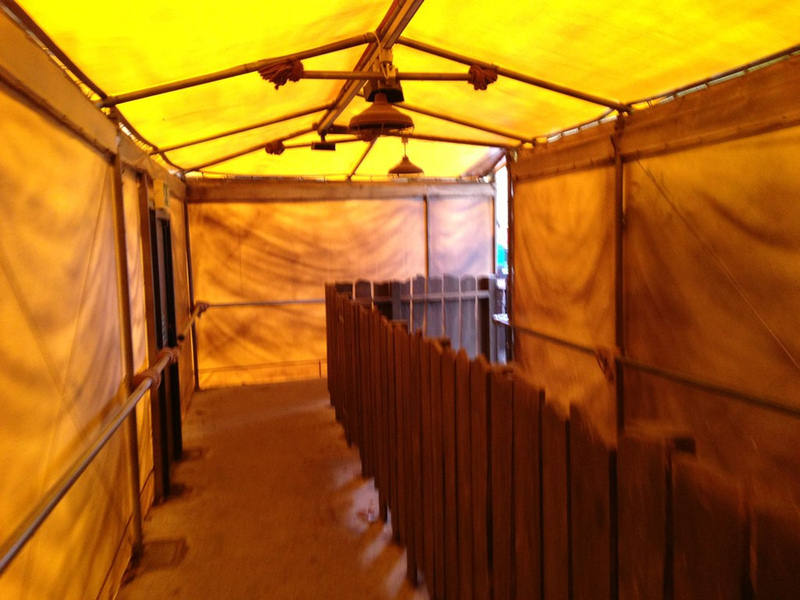 The theming is a bit off, as you encounter all sorts of animals in no particular order. Hey, why are those polar bears hanging out with a herd of elephants? No clue. Wacky theming aside, the kids really enjoyed steering their own boats and this attraction won for the most repeat rides of the day. At the entrance to the Boating School attraction there was a shark to throw another animal into the muddled menagerie. Park guests generally dread having to wait in a long queue. 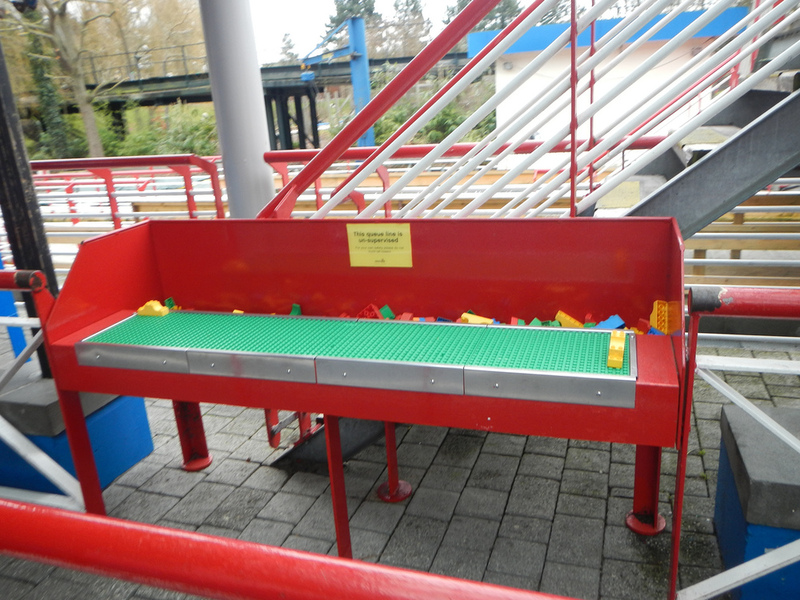 One solution Legoland had to keep guests occupied is to put Lego play stations in the queues. 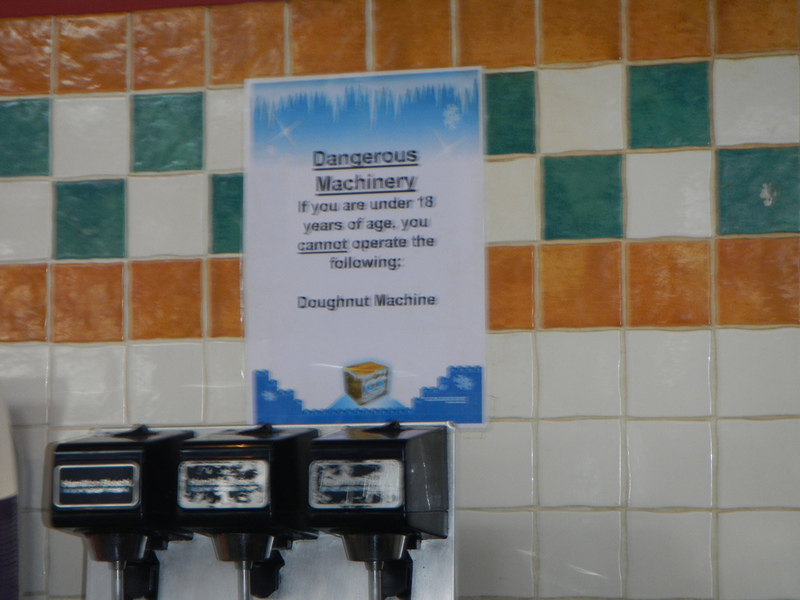 Legoland also made a bold move that I've never noticed in any other theme park. I think that theme park management usually would like to know how they are doing and where they might make improvements, but posting a complaint hotline can potentially be a disaster. Legoland Windsor must be pretty confident in their ability to deliver a great family day out. I was impressed that they posted the sign where park guests tend to be the most disgruntled and irritable. Posted in the Boat queue. In addition to having a Boat School, Legoland has two different driving schools, split by age. Dan's kids were in the younger group and watching the kids learn to drive Lego cars was a really cute experience. Prior to letting the kids drive around a track, they have to go over car safety points, like always wearing their seat belts. Once they are finished with their class, they are told to sit still for their license photos (which is a mock picture taking experience). After the kids drive, an attendant gathers the group up to tell them that they have all passed their driving test and they are handed a drivers license. The staff working at the Driving School are absolutely great with the kids, they exude enthusiasm and are quick to help the kids out when their cars get stuck or they don't understand something. There are some attractions, like the Fire Academy, in which the adults have to do a bulk of the work. 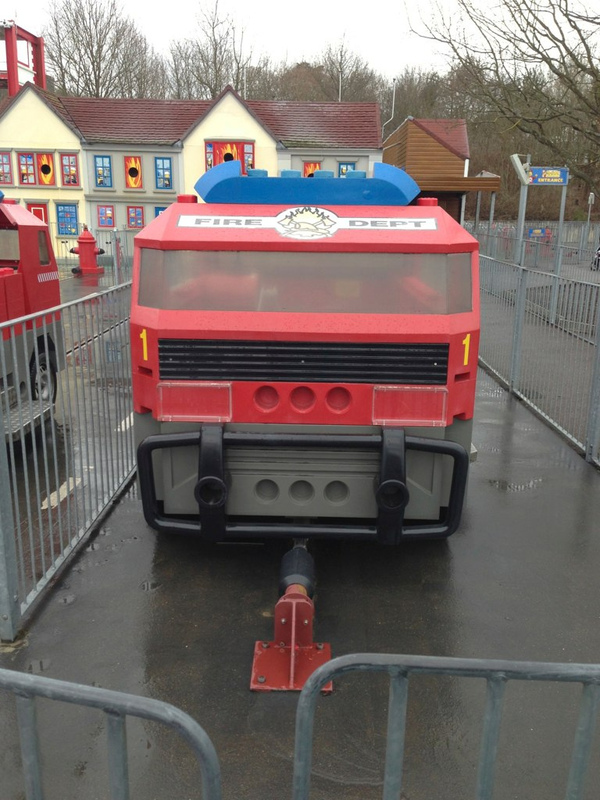 The Fire Academy is an interactive attraction, where kids and adults work together to propel a fire truck (adults moving the truck by pumping) and then jumping out of the truck and pumping water aimed at a burning building to put the fire out and save the day. This attraction takes a lot of muscle and team work. You will build up a sweat as you race to beat the other families that are your competition. There was another balloon ride near the Fire Academy , this one had a pull rope to control the height of the balloon as it circled. On this trip, I learned all about the local grocery stores. Waitrose is the clear winner and they earned my loyalty through their delicious ready-made sandwiches. Dan's parents packed a picnic for us and there is no way that we would have been able to buy a better lunch at Legoland. The salmon and cheese sandwich was so yummy. I can't think of a grocery store in America where I would even want to buy a pre-made sandwich. I also spent the entire vacation gobbling up these delicious cherry tomatoes that Dan's parents had at their home (and packed for our picnic). I've never eaten sweeter tomatoes. They were like candy. I wish we had Waitrose and their pre-made sandwiches in America. There were some cute Lego figures close to where we stopped to picnic. After lunch, we walked towards the Atlantis attraction, stopping for me to have an obligatory flamingo picture. Damn flamingos plague me where ever I travel! A Lego flock of flamingos!!! The Atlantis ride was very cool. It's an indoor submarine ride that mixes Lego sea creatures including mermaids, with real fish, even big sharks! I wasn't expecting to see real animals on the ride. Legoland caught me by surprise many times throughout the day. It's a much better theme park than I imagined it would be. The day was starting to get late and we realized that there was a huge section of the park that we had not yet had a chance to explore. 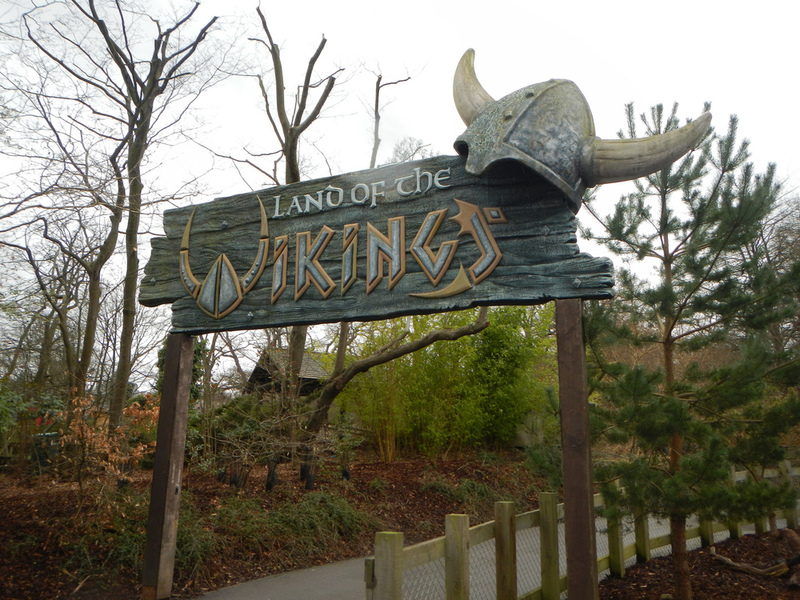 We rushed through the Pirate area and beyond a digger ride that was closed to get to the Land of the Vikings. I'm not sure what spiders have to do with Pirates or Vikings, but between the two areas was a spider themed spinning tea cup style ride, the Spinning Spider. Sometimes zero wait times for rides can be a bad thing, such was the case when we went straight from the Spinning Spider to the Jolly Rocker, a Viking ship themed ride that lifts and dips while spinning. I felt motion sick almost immediately. The only cure for motion sickness is to get lost in a hedge maze. Loki's Labyrinth was challenging enough without being frustrating. Years ago, I did the pineapple maze at the Dole plantation in Hawaii and that was three-hours of misery. Luckily we only wandered around Loki's for about ten minutes until we found the exit. Dan took a panorama shot of the Labyrinth from the observation tower. We saved the best for last and closed out our day in the Knights Kingdom. The medieval themed land has a huge, imposing castle and two dragon themed coasters. We started with the small coaster, The Dragon's Apprentice, first to see how the kids would handle it. The kids loved the smaller coaster and wanted to try to big coaster in the castle. The castle was quite impressive and the ride was not only a decent coaster (I felt my stomach drop), but it also had a dark ride element with dragons, drunk knights and wizards. I think if the Excalibur Hotel in Las Vegas had a ride, this might be it. We took the train up to the top of the hill. I love the Lego butterflies hovering over the train station. 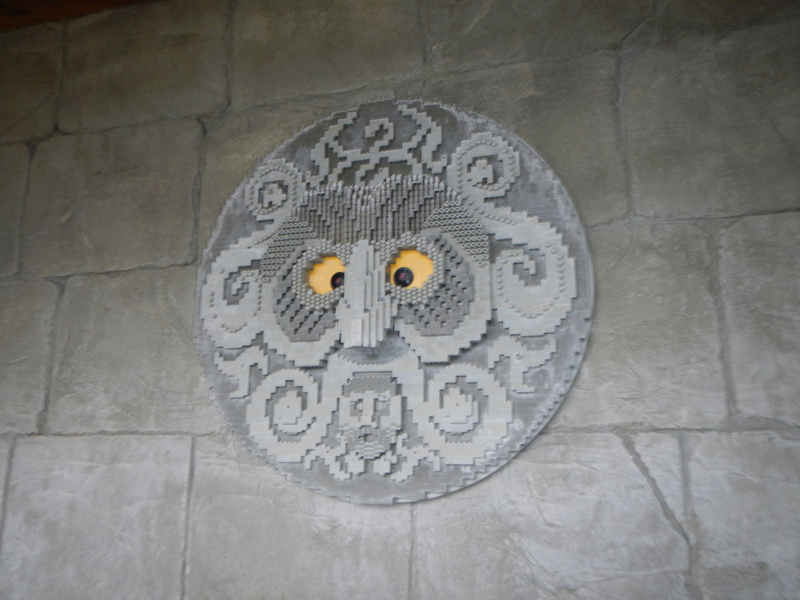 Lastly, one of my favorite things at Legoland Windsor. In America it's a Press, but in England, it's a Mangle! I think I'm partial to Mangle. Thank You to Dan's parents for a wonderful day out in Legoland Windsor. I loved every minute of it!